After all the lead-up to 2014 Cyclocross World Championships, it has taken a while for reality to settle in. The two realities that have come out of this event are, 1. That we must all say goodbye to the rainbow stripes in the men’s race. Maybe we’ll see it make a couple of guest appearances next winter but we surely can’t count on that. And 2. Is that we have to wait another year for Katie Compton get another chance to bring that jersey back home to the US. While watching the Elite Men about to take off at the start, I already had my picks in place based on what I knew about the forms of each of the riders as well as the course conditions which was key in this race. My picks were Zdenek Stybar and Sven Nys for the top two positions, which was pretty much the same pick as most everyone else. Styby may have only done a few events leading up to Worlds, but he’s already proven in the past that he doesn’t need much practice to come good. His focus is on the Spring Classics, which means he will have a very solid power base in those legs. Perfect for ’cross. He only decided at the last moment, a few days before Worlds, that would definitely take part. But if the course would have become more muddy, he would have sat it out, knowing that Nys would be unbeatable. Nys was on top form going into the race – unbeatable in fact, according to all his competitors aside from Styby. But yet Nys remained humble about his aspirations. “I would be surprised if I could win at my age. But it would be wonderful if I could earn a world title directly for my new sponsors,” he had said. When asked if he would trade in all his wins this year for the World title, he was quick to say no. He also admitted that he wasn’t at all nervous going into the race as he has had so much experience with preparation for big events. Maybe this is why he only flew back to Belgium from his training camp in Mallorca on the Thursday before the race and checked out the course for the first time on Sunday – race day. He named Francis Mourey, Lars van der Haar and Styby as his main threats. After that there were a slew of riders who could be fighting for the final spot on the podium. Rob Peeters: Came into top form late in the Christmas period of heavy racing where the courses were riddled with thick mud where he does his best work. When he is on form, though, he can have a top race on any course condition such as his silver medal at the sandy Koksijde World Championships two years ago or his fifth place (first Belgian) at the speedy Zolder World Cup last December. Hoogerheide was not quite muddy enough to play in his favor so he’d be relying on form to conquer all. Klaas Vantornout: After suffering from a viral infection earlier in the month combined with emotional stress he sustained from the whole Belgian Championships debacle where he was (falsely according to Vantornout) accused of offering money to the Belgian Champs race organizer to relocate a barrier, Vantornout had a plan to come good for worlds. A crazy hard training camp in Mallorca just before the big race. If he could properly recover from it, then his form would take that very much needed step higher to land him on the podium. Coming so close to winning the rainbow stripes last year in Louisville, Vantornout was on a mission to make good this time around. Now, if only the Hoogerheide course would have been muddier for him where riders were forced to run a bit more. Tom Meeusen: When you’re on form, anything is possible. Meeusen won the Nommay World Cup a week before Worlds and placed third a week before at Soudal Classics Leuven. He was actually in the lead with less than a kilometer to go in the race when he suffered from a flat tire. While Meeusen was hoping for dry weather the days before Worlds, leaving the terrain a bit slippery but not riddled with mud, he got something relatively close. Niels Albert: He was one of the biggest losses in the race. He was already behind in his fitness due to his untimely illness a few weeks before Worlds. And just when we thought he’d maybe have a chance to come good in the week between Nommay where he was 12th and Worlds, he crashed in the pre-ride the day of Worlds. His wrist was bad enough that he was not sure if he’d take the start. He eventually decided to give it a go, but unfortunately the combination of lowered fitness from being sick and the injured wrist proved to be too much. Lars Van der Haar: This guy knows how to peak for the big events. His World Cup overall leader’s jersey proves it. He is typically better on the faster courses with not so much mud but his mental strength brings this guy a very long way on any type of terrain. Last season, folks were worried that he’d fade after the 45-minute mark as he came from the U23 category, but after he’d remained at the front in so many events this season, he’d proven that he’s grown into the Elite level of competition. 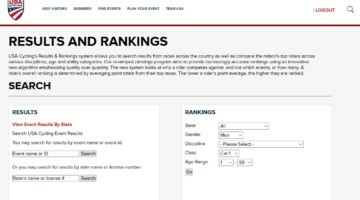 While we may all have our favorites, or our podium picks, luck among many other factors can completely turn a race on its head – literally as with the case of Van der Haar. No more than a few minutes into the race, Van der Haar was flipped over the bars when Martin Bina (Czech pre-race favorite if the course would have been icy like last year’s Hoogerheide World Cup when he won) slid out in front of him. Van der Haar went on to slip or fall a few more times including in the pits during a bike change. The first three times he dragged himself back up to the front but eventually it proved to be too much. Another rider who faded due to the speed on the course was Mourey – a guy who does exceptionally well on heavy muddy courses. Basically, all riders fell victim in some way or another to the blistering pace of Nys and Styby. The two flew around the course so fast [at almost 25kph] that only 42 of the 57 riders of that race got to actually finish all laps without being pulled. With Nys and Styby taking turns attacking each other, it was clear that neither one of them wanted to leave it to a sprint. I’m sure I’m not the only one who gasped when Styby hit the ground when he slid out on that right bend descent and Nys gracefully jumped off the bike and sprung up and over Styby. It clearly looked to be THE move. When Styby crossed the line, I was emotionally torn. These are two guys whom I really adore and admire. They’re both amazingly talented athletes with great personalities to boot! While I was so incredibly happy for Styby, my heart broke for Nys, especially considering my loyalties should be with the Belgians as my husband is one of them. I felt a bit guilty, even, when I grinned a little at Styby’s perfect timing in that last lap. But then there’s the impending tragedy where all of us attached to the sport will suffer. We will no longer get to see the rainbow stripes in action, apart from the odd race here or there. Instead, it will be nicely hung up in a closet, door shut. I will continue to be a fan of Styby and will cheer him on as he pursues his dreams of winning a Spring Classics event. But I only wish the jersey didn’t have to go with him. But no matter how I feel about any rider, I would never go as far as literally boo’ing them on the sidelines of the race, which is exactly what happened to Styby on the final lap as he was going for the win. I understand their frustration as now they’ll never get to see the jersey again, but their actions just left a bad taste in the mouths of the rest of us who had to hear that. Luckily, Styby was able to brush it off. I remember this happening also during the Lars Boom years. Boom had a big mouth and backed it up with his legs, and he didn’t deserve that negative attention. Styby was also attacked by the naysayers who didn’t believe he could only do a handful of races and take the win at Worlds. They don’t believe he’d even be technically skilled enough to do that. As we’ve seen in the past, it takes Styby very little time to get back into the rhythm of cyclocross. And regarding his technical skills, a few years back, he took a whole summer to finely tune his off-road skills. This doesn’t just go away. Shortly after the race, newspaper columnist rik vanwalleghem said in a very demeaning way that cyclocross was basically nothing but an unimportant sport. Well, to have a road racer win Worlds surely pissed him off. As for the racers’ reactions, they simply blew him off. Rob Peeters did have something interesting to say though. He said it that it reminded him of a few years ago when Kevin Pauwels won the Mountain Bike National Championships. 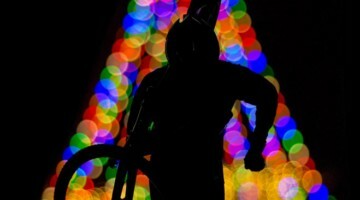 He was proud that a cyclocrosser could do that to prove that cyclocrossers are strong riders. But when a “road racer” takes the grand prize in cyclocross, people react differently. 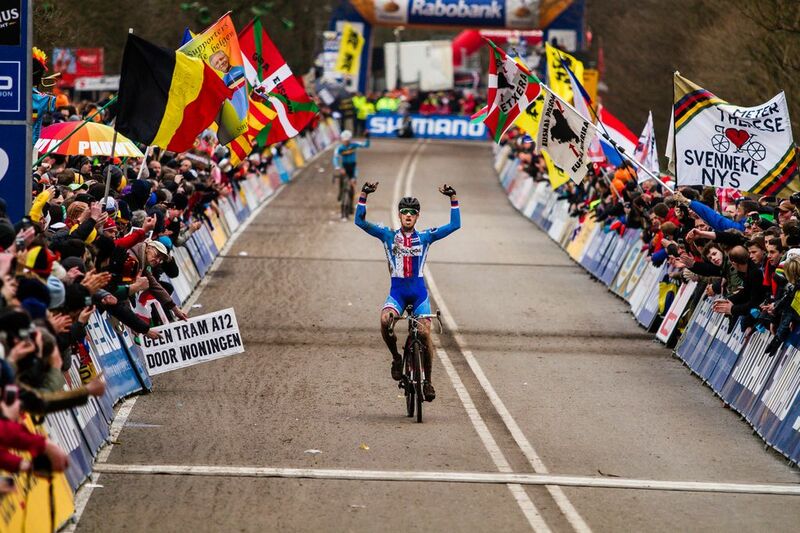 What I think Van Walleghem is forgetting is that Styby is a certified cyclocrosser as well as road racer. Oh, and the prize of the weekend goes to badass Ryan Trebon for finishing the race after gashing open his whole calf from a fall in a descent. It was so huge (and gruesome) that it took twelve stitches to close it. As for the women’s side, it was all American’s worst nightmare come true. 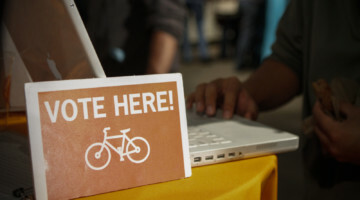 No battle between Marianne Vos [Liv-Giant] and Katie Compton [Trek]. I can imagine that the hearts of everyone watching the race went out to Compton. Compton was already entering the race with a very big strike against her from an asthma attack that took her out of the Nommay World Cup a week prior. As a very bad asthma sufferer myself, I know what it is like to go through what happened to her last week. When it’s happening, it feels as if you’re breathing through a tube the size of a pencil. Taking deep breaths is impossible. Within no time, your whole body shuts down. You are left with only one speed – that of a snail. It is such a horrible experience. The worst part is that it takes days to get the body back in order after a particularly bad one which is what Compton suffered from. If she could have a clean race, I thought, then maybe, just maybe it will happen for her. She is certainly strong and talented enough to take the win. But when she missed her pedal at the start, immediately relegating her to mid-pack, I was devastated for her. But, along with everyone else, I kept the hope. Heck, she’s come back from starts worse than that to take the win. Then shortly thereafter, she tangled bikes with Pavla Havlikova [Telenet-Fidea]. While I watched the two of them calmly untangle their bikes, I knew right away that the energy needed to come back to Vos would be nearly impossible. And if she did it, Vos would eventually win since Compton would have burnt all her matches to get there. Well, Compton did catch the chasers but the win was unfortunately out of reach. Even if everything went well for Compton, the way Vos was riding it still would have been very difficult to take the win. Vos was planning to fight her all the way to the line and had the legs to back it up. It was a good course for her as it was fast with some climbing. But I still keep wondering… What if? What if Compton didn’t have an asthma attack? What if she had nailed her start? Well, if she nailed her start like she did the week previous in Nommay, she wouldn’t have had the tangle with Pavlikova. We at least know that for sure. 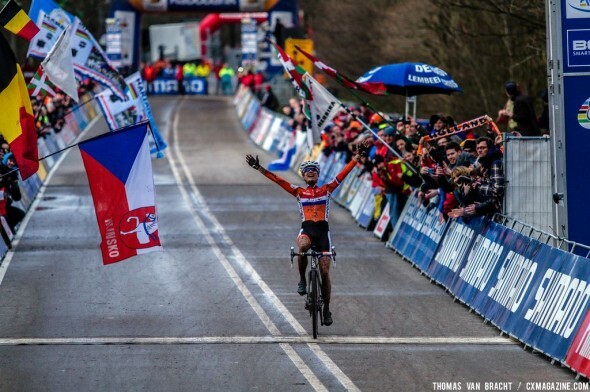 As for Vos, a big congrats goes out to her. It was a well earned win. Another place that was well earned was Eva Lechner for second place. She’d already proven to be one to beat for a podium spot with her fine ride in Nommay, landing her in third. And the ride I’m most excited about was Helen Wyman’s [Kona]. She timed her form to perfection the whole season through. She nailed all four of her goals. Win at Koppenbergcross, win at European Championships, win at British Championships, and podium at Worlds. Way to go! 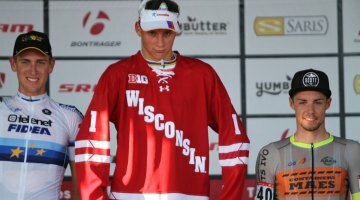 That was the second time a British rider made it on the podium of cyclocross worlds. The first was Louise Robinson who placed second at the inaugural women’s World Championships back in 2000. Just behind her, nipping at her heels, was Sanne Cant [Enertherm-BKCP] who came within two seconds of Wyman in the last lap. It was Wyman’s gut-wrenching run up that last bit right before the finish that gave her a couple of seconds more gap over Cant which proved to be enough to earn her that podium spot. Cant was optimistic about her “loss” though, saying, “Fell just short…but wait until I’m big and strong.” Powerful words coming from a promising rider of only 23 years old. Fifth spot went to Nikki Harris [Telenet-Fidea]. She became ill the day before Nommay World Cup and was hoping on a miracle that she’d be well in time for Worlds. While she may have gotten her miracle, or at least her strong riding looked that way, luck was not on her side. She unfortunately hit the deck which caused her to lose valuable time in a race that doesn’t wait for anyone. A surprise for a top ten was Belgian Loes Sels who placed seventh, ahead of her Telenet-Fidea teammate Ellen van Loy who was up in front at the beginning of the race before eventually fading to 12th . Sels hadn’t even decided to race the ’cross season until just before the start of it. She retired from racing a few years back to have two children and has come back stronger than before. Just behind her was 20-year-old Thalita de Jong who gave cyclocross a real go this winter for the first time. She is coming from a very successful road background to include a Junior World Time Trial title. It was also a pleasure to see our honorary American Caroline Mani [Raleigh-Clement] come in for 10th place – a very strong ride! 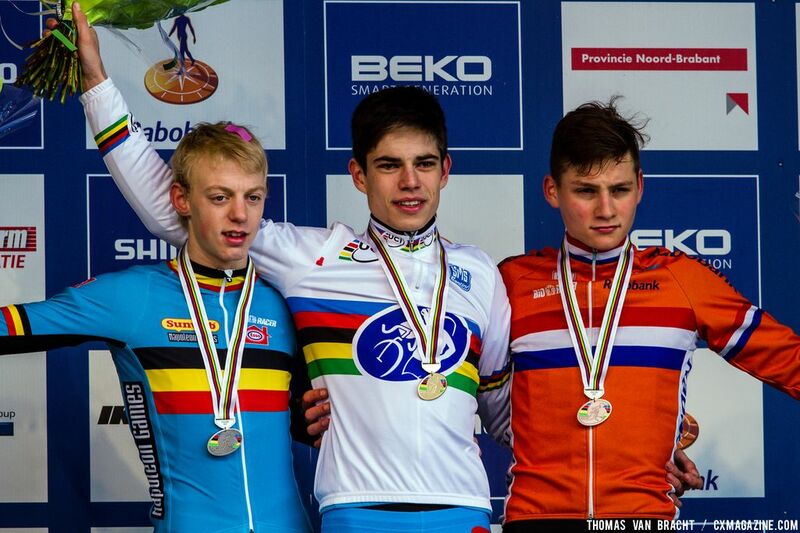 As for the U23 event, I knew all along that Wout van Aert would walk away with the win. After losing out on the Belgian jersey a few weeks previous due to his disqualification from a false start, he was gunning for this win. He would look at the weather report a few times a day to make sure it would be muddy, which would give him even more of an advantage. Better that Van Aert wins the jersey in place of Mathieu van der Poel, people are saying, since Van der Poel has designs of dropping ’cross in search of glory on the road. Meanwhile, Van Aert gets his “professional” status in cyclocross on March 1st and is fully committed to ’cross for years to come – he says. For this race only, I actually made my pre-race podium picks public. I chose Van Aert, Van der Poel, and my former teammate Michael Vanthourenhout. I nailed the podium, albeit in the wrong order. Vanthourenhout is definitely a rider to watch. He has also won the European championships earlier in the season. He got is professional contract January 1st and is proving to be worth every Euro cent. For more World Championship interviews, commentary, predictions and contests, check out our Worlds 2014 page here. 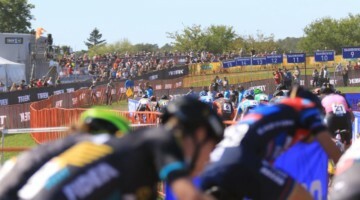 Opinion: Don’t Complain, Take Action to Rescue Bike Racing in the U.S.